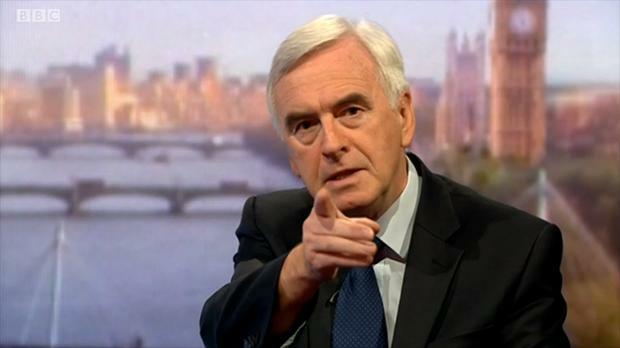 Direct to camera: John McDonnell appeals for Labour Party unity during his Marr Show interview on July 24, 2016. He killed Seema Malhotra’s selfish outburst about her office in less than a minute, with his impassioned plea for Labour MPs who want to oust leader Jeremy Corbyn. Ms Malhotra claimed yesterday that staff members working for the Labour leadership had broken into her office. But Mr McDonnell revealed that the space isn’t Ms Malhotra’s office any more. She had been expected to swap offices with Rebecca Long-Bailey, the MP who took over as Shadow Chief Secretary to the Treasury after Ms Malhotra resigned. Mr McDonnell’s office manager had spotted a pile of boxes outside her office, nearly a month after she resigned and assumed that office was empty, he told the BBC’s Andrew Marr. So the big question isn’t why somebody ‘broke into’ Ms Malhotra’s office, but why she was still there – and why she was accusing innocent office staffers of burglary. But his tone remained conciliatory – a remarkable act of tolerance when one considers the sheer volume of unsubstantiated allegations that have been made against the Labour leadership by the shadow cabinet “quitters” like Ms Malhotra and Angela Eagle – and other opponents in the Parliamentary Labour Party. Perhaps it is right to adopt this attitude in the run-up to the leader election – a more hard-line approach might only provide ammunition to the opposition. Personally, This Writer would like to see every Labour MP who has made evidenceless allegations face disciplinary procedures and possible expulsion by the National Executive Committee. The NEC acts quickly enough when Corbyn supporters like Ken Livingstone are accused. Are we to believe that its members have not received any complaints? Perhaps it is time the members remedied any such omission. John McDonnell, the shadow chancellor, has made an impassioned plea for Labour supporters to stop “trying to destroy our party just to get rid of Jeremy Corbyn” after it was claimed a member of his staff broke into a rival MP’s office. Pausing in the middle of a live television interview and asking “what camera am I on?”, McDonnell issued a direct appeal to Corbyn’s opponents after being questioned over the allegedly illegal intrusion in Sheema Malhotra’s Westminster office. Malhotra, the former shadow chief secretary to the Treasury, had claimed on Saturday that a member of McDonnell’s staff gained entry to her office without her permission, and had lodged a formal complaint with the speaker of the House of Commons. “My office manager has apologised,” McDonnell said about the alleged incident, which Malhotra said amounted to intimidation and harassment of her workers and illegal and unauthorised entry into her Westminster office. Dismissing the allegations and turning the claims of harassment over to Malhotra, he added: “Don’t pick on staff who can’t defend [themselves]. “I have a member of staff, a widow with daughters. She is now worried she will lose her job and face prosecution because it is being described as break-in. My office said it was an error, a month after we thought she’d moved out,” he added. This is getting desperate now from certain members of the PLP. John McDonnell is quite right to tell them to stop. Ms.Malhotra was allocated that office to do a job she chose to resign from a month ago; she had another to go to but chose not to move; a person whose job it is to manage those offices used her pass key to see what was going on, and is now accused of a sackable offence while Ms.Malhotra is accusing Corbyn of bullying. Interesting that on one of the days she cites her staff were “intimidated” they were all in fact out for the day campaigning with Ms.Malhotra herself. Conor McGinn, who has also been “bullied” according to him, is known to have been briefing against the leader who gave him a job. His wife worked for Owen Smith when he was Shadow Sec for Wales, and put herself forward for the seat Stephen Doughty eventually fought in Cardiff – whilst living in London and being a councillor in Islington. It seems to me, after all the examples we have seen of manufactured outrage about alleged bullying, nearly all of which has not been proven to any degree, that those responsible are every bit as incompetent as they accuse Corbyn of being. Which of course he isn’t – he’s never had a chance to get anything done, so how would we know? I’m grateful to you for keeping up with all this. Depressing though it is. It’s timed very well rather like the resignations, who is injured is there any harm or loss it looks very much like a mistake, as you should have vacated the property..
Why have you involved the press surely this could have been sorted in house, it’s becoming so transparent..
Jeremy as regards to the bullying claims online as indicated by the 40 + women MPs, call a meeting have the police present and sift through the evidence, and take it from there..
To our wonderful press can you scrutinise the Tory party they are in power spending billions of pounds not Corbyn, Cameron and Osborne slipped through the back door and in to the removal vans without any questions asked..that’s the mess you should be scrutinising nearly doubling the national debt and creating widespread poverty..
Also can you pay more attention to our non elected prime minister who slipped into Downing Street without a vote..that’s where you should be concentrating your efforts..
Any of these MP’s making these allegations are showing their true character, they do not deserve to be an MP, never mind serve the people in any future government. These are the very people the voters can not trust. I think I disagree with what McDonnell has said here. If Ms Malhotra should indeed have vacated her office by now (technically speaking it ISN’T her office anymore, she resigned remember? ), why does McDonnell or his office staff have any need to apologise for this? It’s not their fault. Surely, if anyone needs to apologise for this, I’d have thought it should be Malholtra herself (especially for writing a letter complaining about a break-in, into her office, which ISN’T her office anymore)? On a slightly different note, if McDonnell thinks that his ‘plea’ is going to be heard…. hahahahaha! I doubt it! /It seems to me that the mutineers are like sulky teenagers. They’re throwing everything out of their basket because their balloon is deflating and they’re trying to stay in contention. As far as bullying goes, none of them seem too bothered about having attempted to oust JC by intimidation over the course of several months. Or is that ‘for the good of the Party’? Malhotra has made false allegations against staffers who had a right, which she did not, to access that office. I am so fed up with this false outrage, which is akin to games in the children’s schoolyard and it is time these people like Eagle and Malhotra were not just called out for false allegations and bringing the party into disrepute(not that the right wing have much of a reputation left)but were also disciplined for it. It’s the only way this Party breaking childishness will stop. McDonells way just won’t work and it would be too little too late if they did desist. We are way beyond that now. Thanks to the brexit referendum, the rats are out of their holes and now we are seing, witnessing these people who not so long ago were supposed to be respected as MP’s with a serious job to challenge the tories, well all the one who complained about being bullied, threatened etc…. not worth shining my shoes, they belong to the gutter and hope they’ll stay there because the Labour party or a new one lead by Jeremy Corbyn is worth more than the money the members have paid to have access to vote. These MPs are trembling of the thought of loosing money throughout backdeals, afraid of loosing positions, all that is based on money but not based on humans, communities, solidarity, no, these people can only appreciate socialism when it is time for the “pleb” to save the banks and tomorrow the NHS. What they don’t realise is that the “pleb” is listening, taking notes, getting informed via the web and in not too far future Damocles’s spade will drop on them, they have asked for it and we can start something fresh, serious, clean, based on proper values where democracy will be restaured and mean something. The world is changing, they need to get reel because this system of neo-liberalism, neo- conservatism is coming to the end, America is not the giant it use to be, the dollar was our problem but not for too long, some western countries are being orientated for a civil war, America is seriously steering trouble with Russia and China, we only get propaganda by the medias, so going to war against Corbyn is nothing compare to what is being prepared, you are acting like mischievous children, it is time to act your age and conduct yourselves for what you were elected to do. I find this rather contradictory even though it is obviously so well intended. You refer to Labour supporters who want to get rid of Corbyn for another leader but who can that be? We have all seen the past efforts of other would-be leaders in turning their heads on bedroom tax and housing benefit cutbacks, the actions of the DWP etc., so I ask again who are they and why would any true Labour member want to lose someone like Jeremy Corbyn for any of them? These members are obviously not really Labour members at all and are perfectly content to risk losing a golden opportunity to have a real leader as PM for their own selfish desires. Personally I find the best way of dealing with this is to let them go their own way as the vast majority of Labour public obviously wants Jeremy. Sadly, it seems that the BBC are not reporting this properly. On BBC News 24 in the evening a clip was shown of John McDonnell trying to talk some sense into all these mudslingers. There was also a mention from the newsreader about a duplicate key but at no time was this tied into an explanation of the fact that Malhotra had no right to be using the office. No mention either of John McDonnells comments about a widowed member of staff with two children who found herself being accused of a sackable offence. That will, of course, be of no concern to Malhotra or any of her fellow travellers. Surely it has reached the stage where John Mcdonnells plea for this treacherous activity to end is converted into meaningful disciplinary action. Nobody says “breaking in” or “burglary”. It’s “unauthorised access”, and accessing an MPs office is taken very seriously. It’s no defence to it to say “they should have moved out a month ago” or “we thought it was empty because we saw some boxes”. We don’t know how Karie Murphy behaved. It looks like the sort of thing that normally wouldn’t be made much of, and even now it was stretching it to have it top story in the Observer. But a complaint has been put to Bercow and we’ll see what comes of it. If you want to argue over semantics, carry on. Yes, we will see what comes of it. I am receiving the comments on this article, but my comment has been censured, please give me an exxplanation. I haven’t seen any comment from you other than one asking me to explain why I haven’t used the comment I haven’t seen. Are you sure you sent me the original comment? Perhaps if you send it again, I’ll be able to help.